Owlhaven bucks are carefully selected based on their dam's (and granddam's) milk production and linear appraisal scores. Show wins are the cherry on top. Click on the picture to go to a buck's page. Gunner has had limited use at stud in the past. However, despite their youth and small numbers, his offspring have already distinguished themselves. He has one finished champion daughter, a second daughter with two legs, and a third daughter with her restricted leg. His daughters have also done extremely well in linear appraisal, with two receiving "Excellent" scores for their mammary systems, and one (Sierra Aspen SW Curtain Call 89 VEEE) receiving the highest score awarded to a first freshener! Gunner is predicted to pass on strength, level rump, angular rear legs, and strong fore udder attachments. Five daughters in five different herds averaged 86.7 in Linear Appraisal. Panache's genetics are legendary. He is being retained with a view to the long-term, bringing the Manuka Honey genetics back into the herd. As a testament to his quality, he placed Reserve Grand Champion in strong competition with a fairly incompetent handler (me). He is a sweet, easy to handle buck who brings the added benefit of being polled! Photo courtesy of Pia Wood, photo credit Michelle Hammon. Heater checked all the boxes during LA as a yearling, so I am confident in his structural correctness. Now he just needs to mature. His littermate, Owlhaven MH Sun Shower 1-06 VG85 (VVVV) is one of the loveliest does in my herd and is proving herself as a producer. I'm excited to see how he crosses with my ​+*B GCH Algedi Farm JD Shotgun Wedding 5-03 VG86 (VEE) daughters. Moon Beam has always been a favorite doe. Besides having a gorgeous udder (she was one of four does selected for final milkout at the 2015 ADGA National Show), and being high-headed (love that! ), she also has the most open escutcheon area I've ever seen, with tremendous width between her hocks, something she passes on to her offspring. Photos courtesy of Ellen Dorsey, Dill's-A little goat farm. Click on the picture to see a larger version. Granddam: SGCH Dill's XM Keena 4*M 92 EEEE, ADGA Reserve National Champion Doe, 7 times ELITE doe! I love the mammary systems that come with these genetics, they are productive, pretty, and extremely well attached. He will serve as an outcross on my Castle Rock and Algedi lines. This is a sweet buck. 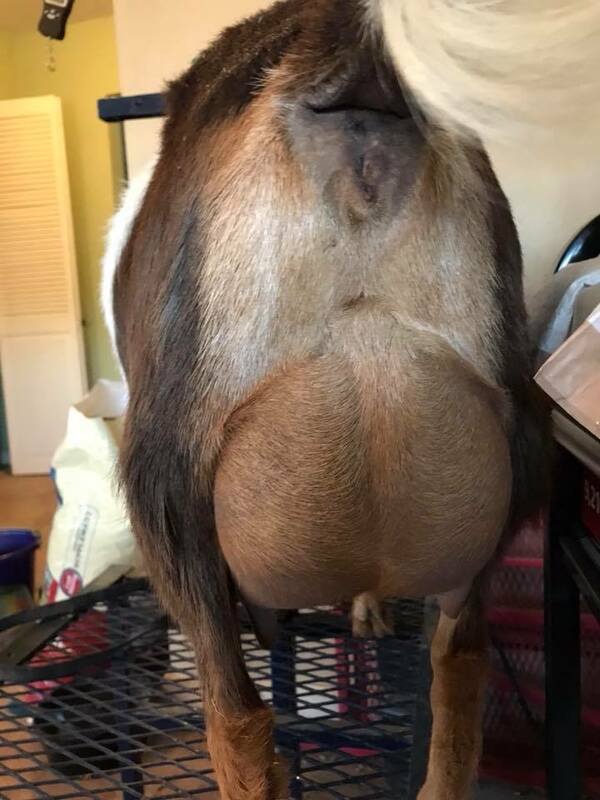 He is a lovely balance of strength and dairyness, with tremendous width throughout, including through the chest, spring of ribs, and between the hocks. He is also very dairy, with a long elegant neck. I don't normally retain bucks out of first fresheners, but Leia freshened with a beautiful udder that combines strong attachments with capacity and ease of hand milking. She shows exceptional promise. Photo of Shotgun Wedding courtesy of Heather Manzo, Sierra Aspen Ranch, photos of Wedding Proposal (Posie) courtesy of Algedi Farm. Besides being extremely correct, Vodka has ALL the bling. How could I not retain him? His dam, Blue Velvet, is a maternal sibling to two great show does: SGCH Sierra Aspen Sky Pilot 2*M *D AR 3057 and GCH Sierra Aspen SW Honeymoon Rose 2*M. His sire, Shotgun Wedding requires no introduction He's the sire of Honeymoon Rose and Sierra Aspen SW Curtain Call 89 VEEE (first freshener), a doe with two Champion legs before her untimely death. 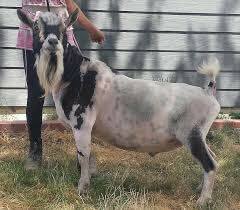 Because I choose not to show my goats due to biosecurity concerns, I've rehomed his dam to a show home where she can reach her fullest potential. Hover over pictures to see the captions. Click to see a larger version. Whiskey's genetics need no introduction. Her dam, Lucille Two, was an exceptional show doe. Whiskey is even more striking in appearance, scoring 91 EEEE from one of ADGA's toughest appraisers. Besides having an Excellent mammary system, she is excellent in shoulder assembly, legs, and back. She is very good in all other structural categories, including her rump, which is very wide and level! Whiskey is 21..5" tall at 6 years old. Hover over pictures to see the captions. Click to see larger versions. 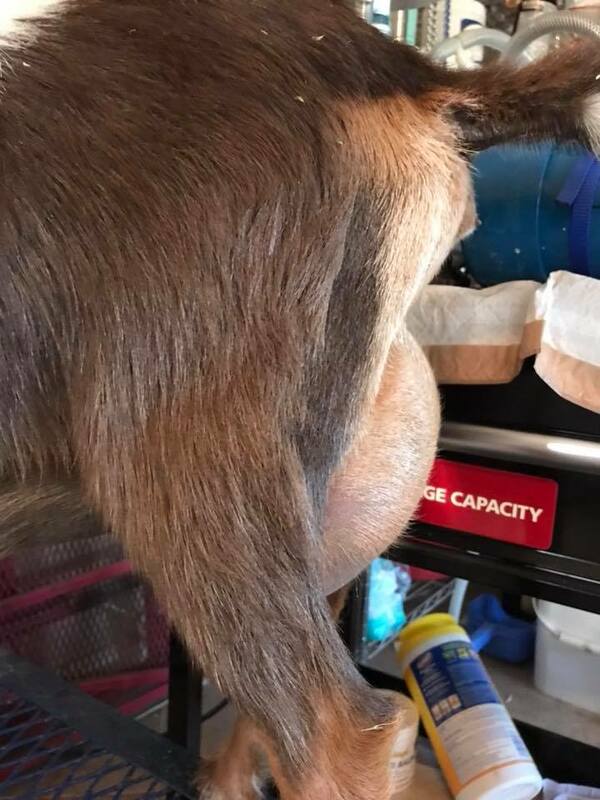 Sugar is a beautiful young doe with the beginnings of an outstanding mammary system. As a yearling first freshener she received an enviable score of VG86 VVE+. Her mammary linear traits were some of the best in the herd: fore udder attachment 32, rear udder height 37, rear udder arch 35. 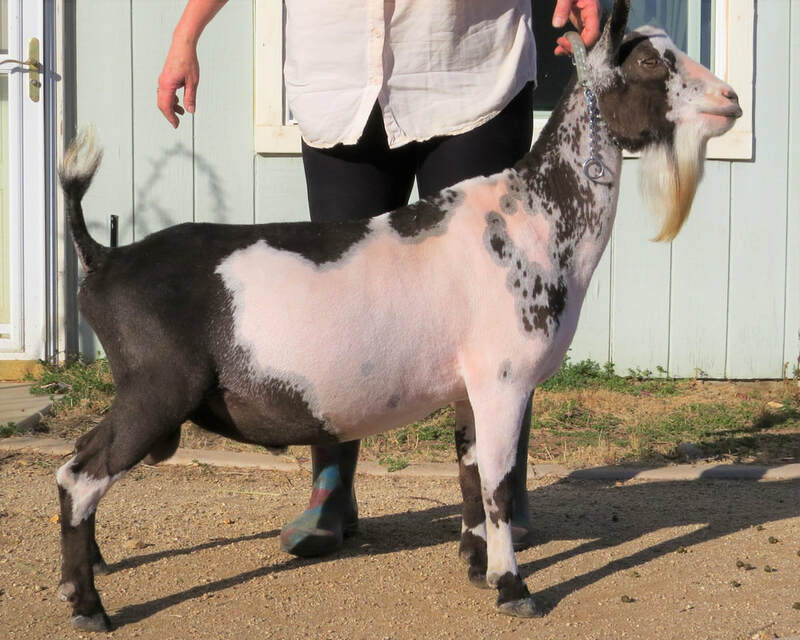 - This is a 1.6% linebreeding to SGCH Rosasharn's UMT Tupelo Honey 4*M.
Leia is a great choice if you are looking to improve general appearance in your herd. Per our ADGA appraiser, her shoulder assembly is very good. Her legs, feet, and back are excellent. Her rump is good (this is excellent coming from an appraiser who rarely gives good marks to Nigerian rumps), it is both level and wide. She has a lovely mammary system that just needs maturity. Her teats are plumb and easy to hand milk and her attachments are broad and strong. Leia went Reserve Grand Champion at the highly competitive Chino Show in 2017 with a novice handler.